We are greeted by scorching heat in Port Sudan. Followed by our safe landing, we are already sitting in mini buses and we are on our way to the marina. Most of the group are first-timers to Sudan, while this is my ninth adventure to Sudan and the fourth in this region. Still, I am just as elated as anyone else. It does not take long to get to the marina. We have a few bites to eat, unpack, set up our diving gear and we are off to sleep. The following day, we wake up to the clinking sound of the anchor chain. We leave the marina under the rays of the rising sun and head for Shaab Jumna. The sea is calm and as the sun rises, so does the temperature and everybody tries to hide in the shade. 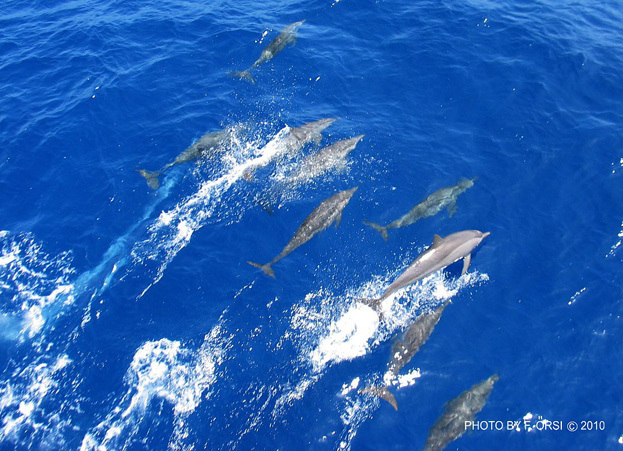 Then somebody shouts out from the bridge: “Dolphins!” A huge school of dolphins join us and everybody rushes to the front of the boat. The graceful creatures are enjoying the waves created by the bow, then disappear after ten minutes of playing. Shaab Jumna appears after about six hours of sailing. 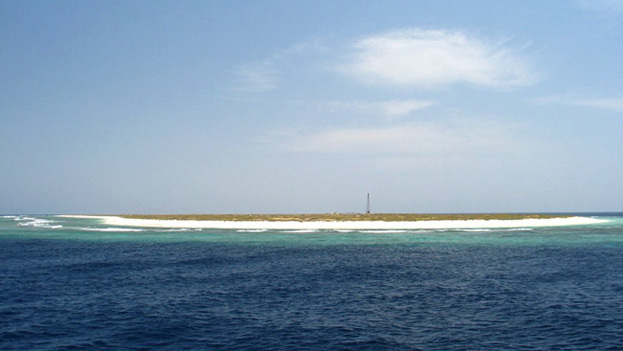 Two small concrete columns and a small automatic lighthouse are the only signs in the middle of nowhere that the waters are not a thousand metres deep here. When the sea is not still, the surf warns the boats in advance of the dangerous reef beneath the water surface but the concrete columns do the trick despite the GPS. We set anchor at the south end and we get into the zodiacs in groups. 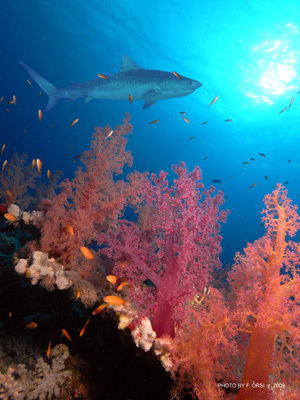 The reef stands all by itself in the deep seas, the closest shore or reef is 40km away. If we are lucky, we could meet the reef’s main attraction, one of the largest schools of hammerheads in the Red Sea. We descend along a perfectly vertical wall. Visibility is fantastic and the currents are weak. In a few minutes hundreds of barracudas surround us. They stay with us, fearless, for several minutes. We are amazed by the giant cloud of these half-metre silver torpedoes. Then Dani and I separate from the group, full of confidence, and we swim out to the blue at 20m for the hammerhead “hunt”. The reef is barely but still visible, we do not want to swim farther out because once the currents pick up, we could be swept out. We wait in patience as do the others from the left and right of us. Time is passing slowly, not much excitement happening. Suddenly the silhouette of a giant fish appears in the blue. Our hearts skip a beat but it is “only” a marlin. To a photographer’s eye, it is not a good shot, as it is 20m from us and you need at least 3-4m where you can have your shot. Sadly our time is up and so is our air but no hammerheads in sight. We ascend a bit disappointed but admit, here we are the ones being looked at and not the other way around. The zodiac is buzzing with excitement. It turns out, both groups had a run-in with a huge school of hammerheads, and some got as close as only a few metres. We were the only ones who were left out. At first we think they are just pulling our legs but all doubts disappear when they show us their hastily taken photos. We missed them by about 50m! We were in the wrong place, at the wrong time. No worries, there will be other opportunities, we think, though our smiles are not genuine. We reach the northern lagoon of Shaab Ambar just in time, before sunset. When the winds are high, the captain must really watch to keep the boat in the middle of the channel. We are in, anchors down! Heavenly smells are coming out of the kitchen and we are marvelling at the others’ fantastic shots of the hammerheads. We go to sleep early after the delicious dinner. Tomorrow we are going to be on the regular schedule of three dives a day, for two weeks straight! 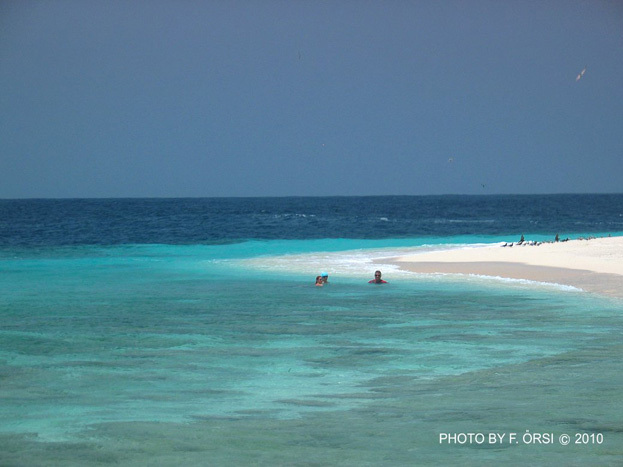 We leave the lagoon in the early morning and head for the south corner of the reef system. Shaab Ambar is about a 12km-long narrow reef with several passages in the middle which cannot be entered by larger boats. We anchor near the corner of the west side and approach to the dive site by zodiacs. The corner of the reef is an interesting formation. It ends up in an arched plateau of 150m in diameter which is bordered by open, low coral hills before it drops into the deep. The middle of the plateau is a flat, sandy and empty area at 25m deep. It ends in gigantic coral walls on the north side which form a half-shaped amphitheatre. We are not bored. In the first minutes a group of barracudas show up in tow with some hammerheads from the south. They turn a few times then disappear. White-tip sharks snooze in the sand and by the ledge, a giant stingray is racing with a large turtle and at the base of the walls, grey reef sharks cruise. We can also see a few hammerheads by the eastern drop-off. As we ascend, the sea is bustling in the shoals as well. The tip of the reef here is at 5m and as far as the eye can see, it is a surge of yellow. Thousands of sweetlips hover undisturbed. 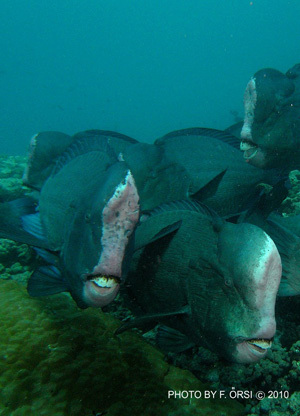 Afterwards, we are stared at by dozens of humphead parrotfish, 11/2-2m in size. The layout of Shaab Ambar is optimal for making satellite trips to the nearby reefs of Keary and Logan and Turtle Island. We see hammerheads at all the sites, mainly at the north corners. We spend two days in the area and all our dives are just as busy as the others. But dozens of other reefs are waiting for us and we must leave here, heading for the south. Protector Reef is along our way and we spend a day there. We do not regret is, it is a fantastic reef. It is a lot larger than Logan or Keary reefs with an intriguing shape. Sandy bottomed gorges at 25m slice through it in several places in an east-west direction. 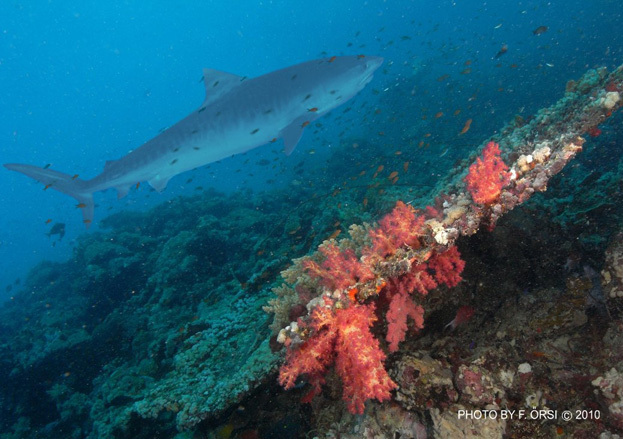 The southern tip of the reef is a long and very narrow wall-like formation engulfed by corals at 30m. We hook ourselves up as the currents are very strong and watch from box seats as 4 hammerheads dance ballet above us. Unfortunately, it is again the lack of air that ends our enjoyment. It is a good thing the currents are taking us in the right direction and it is easy to get underneath the belly of a giant manta. Coral life here is healthy and abundant in soft and fan corals. We run into numerous turtles and barracudas. It is amazing how versatile in shape the southern reefs are. In the Sudanese region you can find anything from the round cake shapes through the plateaus all the way to the steep walls but this site is even more unique than the others. The sandy bottomed plateau is 100-150m in diameter and it is surrounded by giant towers with a few 1-2m wide gorges. From the inside, they seem to be 25m high but their outer walls drop into the deep blue. It is a true amphitheatre. The gladiators arrive in the shape of a non-transparent cloud. 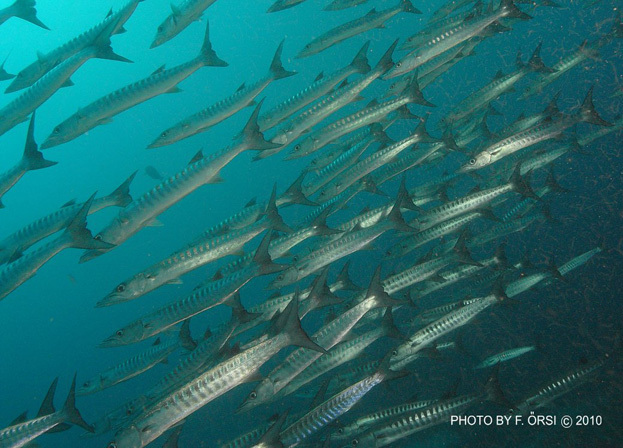 There are thousands and thousand of barracudas. I lie on my back in the sand and the infinite cloud gets closer and closer. I even forget about my camera, it is all so surreal. They surround me, cover me as silver tornadoes – an amazing feeling. The parade lasts for long minutes then they slither away into a gorge. It is obvious they have never seen a diver here! Our next stop is this small island with a automatic lighthouse in its middle. We are going to spend two days here. We start out in two groups and we get into the water at the south corner of the reef. Wow, what a sight! The corner of the reef looks just like the bow of a giant ocean liner with a narrowing plateau on the east side at 25-30m, dotted with a few lovely coral towers here and there. The other side continues in vertical walls, their bottoms invisible. We swim right out to the sea with crystal clear visibility and six-eight hammerheads show up, then more arrive. As they are at 10-15m and we are beneath them, their silhouettes are clear against the surface backdrop. Afterwards silky sharks swim toward us, five in total, all in a row. What an abundance! So, what should I shoot? It would be great to photograph them all together and as if reading our minds, they all mingle. Thankfully currents are weak and we can stay out at sea for a while. As we get low on air, we slowly move in the direction of the terrace. Now we can see its dimensions. It is about 40-50m wide and 200m long, narrowing toward the north. The end is bordered by large coral blocks and mushroom heads then continue into a vertical wall. A giant turtle snoozes by one of the blocks. We almost reach the end of the terrace when five-six pilot whales appear on our right. They swim slowly, undisturbed but we have no chance to get close to them. Never a better safety stop! It is a truly undiscovered site. We jump in at the north corner, full of anticipation. At first, the reef surrounding the island looks ordinary. Walls and infinite depths. Then all of a sudden everything becomes intriguing. We barely swim 30m out when a school of uncountable hammerheads show up. They circle us several times, a few adolescent specimen swim by only a couple of metres from us but the adolescents are herded back to the group. A couple of minutes pass and the waters are empty again. We wait a bit longer then the two of us swim back to the wall while the others, being the optimists, stay behind. Our prize is a beautiful balcony-like platform. It is not big but we can barely see the corals from all the fish, swarming in unbelievable numbers. Perhaps Ras Mohamed in the summer full moon can only get close to this view. Coral life here is exceptional. The 50x25m balcony is closed by a giant coral block which is surrounded by barracudas. We find out in the zodiacs that the hammerheads did return. We also saw silky sharks, turtles, stingrays, white-tip sharks. We continue on toward the south, heading for Dahrat Quab Island. As we approach the banana-shaped sandy island, our captain and the dive guide begin to act more and more peculiarly. I know they are hiding something but despite all my efforts, they tell me nothing. The island is a couple of hundred metres long, lying in the east-west direction. It is narrow across and provides protection only when winds are from the north. The boat is protected from the south. Spending the night here is not too promising but there is no alternative in sight. The following morning during the briefing the captain mysteriously tells us: “You are all here to see sharks, so do not panic, whatever may happen.” Now this gets everyone wound up! 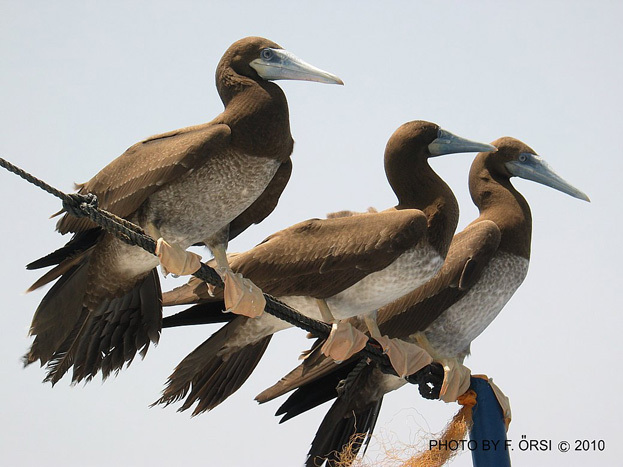 We do not dive right by the island but by the southern corner of Habili Lori, a several hundred metres long reef at 5m, a ten-minute zodiac ride away and which, incidentally, was discovered by our captain. We enter the water, visibility is excellent. The spot is beautiful with a 50x25m plateau at 26m, and with a unique large coral block on its top in the middle. Coral life is gorgeous, everything is covered with colourful soft corals, huge fan corals sway, among them, giant schools of fish. Ok, I think, it is all beautiful but we have already seen stuff like this. So, what was all the fuss about?, I say to myself while I am slowly drifting toward the drop-off. Then I turn in the direction of the plateau and I cannot catch my breath, my heart skips a beat! A tiger shark! 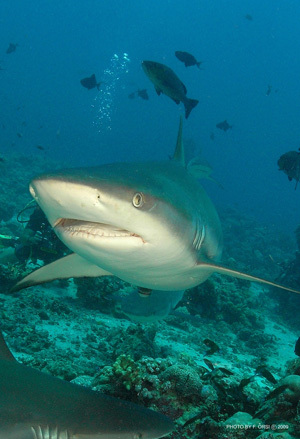 It is being followed by a grey reef shark underneath its belly and the size difference is clearly visible – the tiger shark is about five metres long and pregnant. At its belly, it is as wide as a mini bus. My word! After 18 years and 1,310 dives, this is my first tiger shark. And the size of her! I cannot believe my eyes. Then another one appears, seemingly bigger than the first one and she is pregnant too. The third one is slightly smaller but three tiger sharks in an area of the size of a handball court is no piece of cake. The width of their mouths is at least half a metre, we could not stand a chance. Thankfully they are not aggressive, they are only checking us out curiously with those black eyes. They swim lazily around the plateau, they do not come closer than three-four metres. Though I do get a bit anxious when it is time to swim back to the wall of the main reef in the currents which are getting stronger, where at least our backs are protected. I can see many would rather just jump these forty metres in a second. Once back in the zodiac, we keep cutting into each other’s sentences and trying to release the tension. A few of us are a bit pale, for them these measurements are a bit too much. Now it is all clear why the captain and the others did not want to talk about this. A week earlier they were in the same spot and saw the tiger sharks but they were not sure they would be still here. But they were! This is the last island before the Eritrean border. The Red Sea becomes quite shallow before the Eritrean border shores, from 700-1000m depths to 30-40m depths. The real depth remains only in a narrow strip in the middle of the sea. The Dahlak Bank Island and reef labyrinth is an enormous area, about 1600km2. These were the summary of several of my tours in Sudan. Divers must know that the reef marine life can change from one hour to the next due to the moon and the tides, the direction and strength of the currents, the winds, the surf and due to all other factors. Hammerheads may show up at sites we would not expect or disappear from sites they usually frequent. So, never forget: nothing is 100% guaranteed under the water, you also need Lady Luck on your side! Posted in Blog, Featured storiesTagged abid, dahrat, deep, diving, island, liveabord, loka, protector, scuba, south, sudanLeave a Comment on The Sudanese Red Sea – In Unknown Waters down to Eritrea!